Is your garden shed filled to the brim? Do you yearn to update your backyard and build arbor? This site takes a look popular wood sheds and garden arbors you can build yourself. 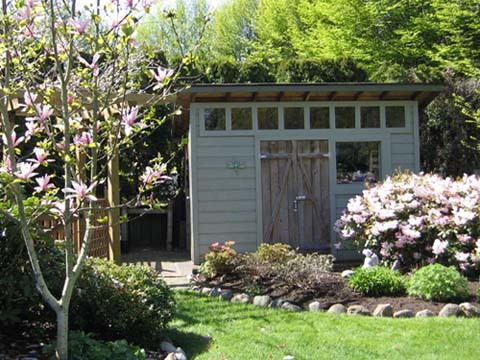 Sheds are a very practical structure that most people have in their backyard. And if you don't have one in your backyard you probably really want one. They can add character to your backyard, but mostly they are a great place to store things. I want go into the details of what you can store in your shed, because you probably already know all of the thing you want to put in there. The other nice thing about these outdoor structures is that they are fairly easy to build and there are a few options available. You can purchase plans if you want to start from scratch and maybe modify the design. Or you can purchase a kit, that will come with everything you need including pre-cut wood and all of the shed roofing material. Shed Plans — Information and pictures on a variety of shed plans. Even if you are just thinking about building a shed it is great to check out this page to get some ideas for your next shed. Shed Kits — The first shed I built was a ready to go shed kit. I picked out the shed I wanted and they dropped off two pallets of building material. Easier to build than a shed from plans but a lot cheaper than a custom built shed. Besides being the BEST place to kiss in the garden, the classic arbor supports or trains climbing plants, such as roses or grape vines. You can also build arbors that include benches or gates. They are also useful to to designate the end of one area and the start of another area. 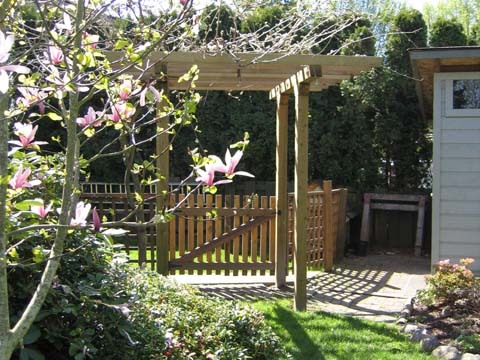 You can purchase a complete arbor that you just need to install in your garden or you can get a kit that will require some assembly and then you can install it. Your other option is to use a set of good plans and build the wood arbor exactly as you want. This is also a cheaper option, but it will take more time to complete. A pergola is like an arbor only bigger, usually extending from the house to cover a walkway or seating area. You can also have a pergola in your backyard to provide a nice shady are for those days you just want to relax and take it easy. Arbor Kits — A review of the best arbor styles around, from traditional to modern arbors and a variety of building materials including; copper, iron plastic and wood. Arbor Plans — If you can't find the right kit you can build your own arbor using plans. So if you want your arbor to be bigger, taller or whatever - you can customize the plans to your design. Pergola Plans — Build your own pergola from scratch using these classic plans. Trellis Kits — Flat structures that help climbing plants find their way up walls, gates, and fences. In wood, wire, metal, plastic, and twigs. Greenhouse Kits — If you've never had a greenhouse, but always wanted one, greenhouse kits may be for you. Patio size to walk-through greenhouses in glass or plastic.